Preheat oven to 425. Butter a 2- to 3-quart heavy baking dish. Gently stir frozen blueberries, lemon zest, preserves and cinnamon together in a bowl. Pour into prepared dish. Combine flour, 1 tablespoon of the sugar, baking powder and salt in a food processor and process briefly to blend. Add butter and pulse until mixture resembles coarse meal. Pour in half & half and pulse just until dough begins to pull together. Remove dough from processor and knead briefly on a lightly floured surface to form a ball, adding more flour if dough is sticky. Break pieces of dough from ball and cover berries with slightly flattened pieces of dough in a "cobbled" irregular pattern. Sprinkle on remaining 2 tablespoons of sugar. 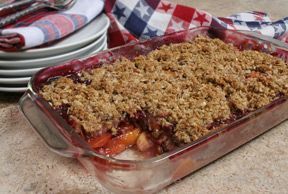 Bake until crust is lightly browned and berries are hot, 25 to 30 minutes. Remove from oven and let stand for at least 15 minutes before serving. 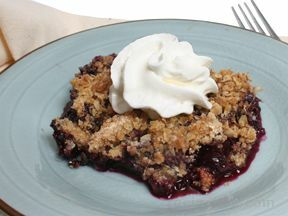 Serve with sweetened whipped cream, vanilla ice cream or yogurt. Serves 6.